“VCU physics professor Loren Picco, Ph.D., is among a team of researchers that is the first to produce quantities of potentially revolutionary ribbons of phosphorene. 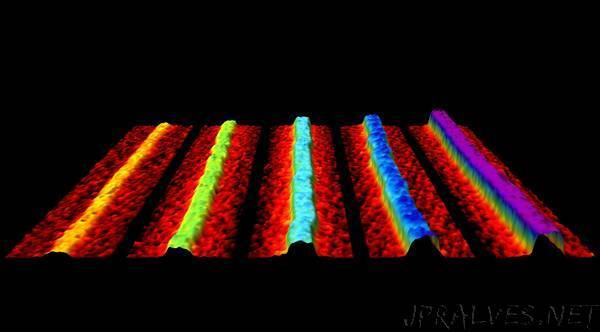 Since the isolation of 2-dimensional phosphorene — the phosphorus equivalent of graphene — in 2014, more than 100 theoretical studies have predicted that new and exciting properties could emerge by producing narrow “ribbons” of the material. Now, those ribbons have been made and measured for the first time, and they could revolutionize electronics and fast-charging battery technology. In a new study published in Nature, researchers from University College London, the University of Bristol in the United Kingdom, Virginia Commonwealth University and Ecole Polytechnique Federale de Lausanne in Lausanne, Switzerland, describe how they formed quantities of high-quality ribbons of phosphorene from crystals of black phosphorous and lithium ions. One of the study’s co-authors was Loren Picco, Ph.D., associate professor in the Department of Physics in the VCU College of Humanities and Sciences. Picco’s research involves video-rate imaging with high-speed atomic-force microscopy, which enabled the detailed and rapid analysis of ribbons, in collaboration with the University of Bristol. The researchers believe the new material could be applied to technology such as batteries, solar cells, thermoelectric devices for converting waste heat to electricity, photocatalysis, nanoelectronics, quantum computing and more. The nanoribbons are formed by mixing black phosphorus with lithium ions dissolved in liquid ammonia at -50 degrees C. After 24 hours, the ammonia is removed and replaced with an organic solvent that makes a solution of nanoribbons of mixed sizes. These ribbons were then shipped from UCL to Picco and the team at Bristol for analysis. While continuing to study the fundamental properties of the nanoribbons, the team intends to also explore their use in energy storage, electronic transport and thermoelectric devices through new global collaborations.